The overarching theme of Dussehra (or Vijaya Dashami as it is also known) is that of victory. According to legend it is celebrated as the victory of good over evil. Dussehra is still an occasion where one must fight against evil, though the form it takes has changed over time. Today one of the evils we stand as a society to combat is the social ill of child hunger. In a country which is home to a quarter of all undernourished people worldwide, where nearly 39 per cent of children under the age of five are stunted and 15 per cent in the same age group suffer from wasting, it is crucial that we as a community come together to protect our children. The Akshaya Patra Foundation works every day to provide a safe, healthy, fulfilling childhood to the youngsters in India. By following its vision that ‘No child in India shall be deprived of education because of hunger’, Akshaya Patra provides the wholesome mid-day meals to over 1.4 million children every day. This Dussehra help us achieve victory over classroom hunger by supporting our programme. A contribution from you will mean more children getting healthy every day. Here at Akshaya Patra, we are excited to announce the launch of our new website www.hopestories.in which goes live from today, 14 October, 2015! The website offers an opportunity for readers to connect with the lives of our beneficiaries, school teachers, principals, parents, organisation staff and many others who have been influenced by our Mid-Day Meal Programme. Hopestories.in therefore features a wide range of stories and snippets featuring these fascinating people, their aspirations and the impact of the programme. The site also includes short video testimonials of our beneficiaries who speak about their ambitions, the mid-day meal and how it has impacted them. With this assortment of stories, you will be able to journey through the diverse lives of our beneficiaries and learn more about our Mid-Day Meal Programme. The Hope Stories website is designed to be user friendly and has an attractive navigational panel for visitors to scroll through the stories and also increase your awareness on the Foundation’s support towards its beneficiaries. You can also support this initiative by contributing stories to our page. We invite you to contact us to set up a visit to our beneficiary schools near you to interact with the children, staff and parents, and send in pictures, videos and snippets capturing their stories. We hope that you will enjoy visiting our website and immersing yourself in its stories. We welcome your valuable feedback so we can continue to improve. Celebrate Daan Utsav (Joy of Giving Week) 2015! Daan Utsav (Joy of Giving Week), India’s ‘Festival of Giving’ is back! Celebrate Daan Utsav 2015 with The Akshaya Patra Foundation by giving underserved children across India the opportunity to receive daily food and education, and transform their lives. Discover the joy of giving to those in need by ensuring that children do not have to choose between receiving a daily meal and receiving education. And there is very little more joyful than giving children the opportunity to fulfil their potential. Akshaya Patra’s daily Mid-Day Meal Programme ensures that children have access to at least one nutritious meal a day, and a chance to realise their ambition. This Daan Utsav, go beyond previous years and give! Give a meal, give education, give opportunity and most of all, give hope. Use this time to spread happiness and hope to young children and their families across India. Contribute to The Akshaya Patra Foundation and play an active role in India’s largest philanthropic event. To donate, click here. Raksha Bandhan is a time of shared love and harmony. An auspicious occasion in India, this day is celebrated by millions across the country irrespective of religion, gender or age. The term Raksha Bandhan in Sanskrit literally means ‘tie or knot of protection’. Traditionally the Rakhi is tied between brothers and sisters to signify a brother’s protection of his sibling. This Raksha Bandhan, we ask you to extend your love and protection to children in need. Help secure their dreams and aspirations for the future by shielding them from hunger and illiteracy today. Your support can provide them with #BhojanSurakshaBandhan. Find out more about how you can help provide #BhojanSurakshaBandhan here. Welcome to my summer project blog. I’m Jayati Sharma, a twelfth grader at Basis Scottsdale, a high school in the U.S. After having organised a benefit concert for the organisation, I’m conducting a research project with The Akshaya Patra Foundation, the largest NGO-run mid-day meal program in the world. My main objective is to learn more about the noble organisation and to find ways to contribute to it further, while also focusing on certain nutritional aspects that make the program so successful. What you’ll find in my blog posts are my thoughts on my travels: kitchen visits, interactions with schoolchildren, and interviews with a host of individuals working within the organisation. I hope you enjoy the journey as much as I already am and find the cause just as uplifting and inspiring. One child can have a huge impact on another child’s life with just a simple donation. Encouraging a child to do something outside the realms of academia in support of another child helps foster a sense of compassion and shapes a grateful attitude towards society. This is what makes the Me & You campaign organised by The Akshaya Patra Foundation inspiring. The campaign encouraged young children from two international schools in Bengaluru to contribute something to our beneficiary children in Government schools. The campaign drove home the fact that by sacrificing something as small as Rs.63, even children can help feed an Akshaya Patra beneficiary for a month. The campaign, which has so far run for one month, had youth volunteers from IIM Indore and Flame participating and encouraging students to sacrifice some of their small desires to feed a child. The first phase of the campaign was organised at Primus Public School on June 17, 2015. Volunteers from The International School Bangalore and Chitrakala Parishad joined the second phase of the campaign at Prakriya Public School on July 9, 2015. The students from the two schools made generous donations, some of them even willing to donate their pocket money towards the cause. The 5th grade students from Primus school collated a generous contribution of Rs.66,000 which will be utilised to feed children in our beneficiary schools. This generosity displayed at such an early age is heart-warming and will undoubtedly help the students become socially responsible citizens who make giving a regular part of their lives. “For the first time, I was given a shoe that was new and not worn by somebody else. I felt I owned something that I could be proud of,” says 11-year-old Ruchi, from Mathura, Uttar Pradesh. This is the impact of TOMS Shoe Giving partnership with Akshaya Patra. TOMS has partnered with Akshaya Patra to give new shoes to standard 1 to 10 Government school children to promote good health, education and self-esteem. Akshaya Patra received nearly 600,000 pairs of new shoes from TOMS as part of the Foundation’s ‘Beyond the Meal’ programme, and thus far has distributed over 524,000 pairs to students in Vrindavan, Nayagarh and Ballari. The remaining shoes will be distributed in the coming months. Through the Beyond the Meal programme Akshaya Patra partners with corporates, individuals, NGOs and other agencies to address obstructions to the proper implementation of the mid-day meal programme. By enabling students to wear shoes regularly, TOMS and Akshaya Patra are promoting healthy habits in the children that will change their lives for years to come. Regularly wearing the shoes will improve their health by reducing foot-related diseases and exposure; their improved health will have a positive effect on their nutrition, class attendance and cognitive abilities, and also nurture a sense of pride and self-esteem among the students. Since many of the students benefitting from the initiative have never owned a new pair of shoes in their life, the shoes act as an added incentive for students to attend school. The shoes being of good quality also help protect the students from harsh weather conditions, and from sustaining injuries. “We don’t have proper roads in the village. It is mostly mud roads. Earlier when I walked barefoot, my feet often hurt and they would be covered in dust. I also had a lot of bruises and cracks in my feet. Because I wear shoes now, I can avoid all that. I have also learnt that I can get sick if I don’t wear shoes regularly as the germs can infect through my feet. Also, I think I look nice with my shoes on. I thought only children in the cities were lucky to own shoes, now I do too,” adds young Ruchi, with heart-warming honesty. “For the first time in my life, I was wearing new shoes, and for the first time I was going to school in complete uniform, I felt extremely happy and proud to go school wearing my new shoes,” Chaitra adds. TOMS Shoes have had a profound impact on the daily lives of these children. “Walking barefoot can make it tedious to attend school. Now TOMS’ new shoes makes the school journey easy and pleasant. 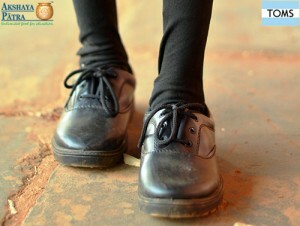 Wearing their own new shoes triggers a sense of pride, confidence and uniformity in children. Going to school is now more fun. The children also realise the importance and benefits of wearing new shoes. It also enhanced their sense of cleanliness. Eventually children can bring this awareness to the people they know,” says Shridhar Venkat, CEO of Akshaya Patra. On their own they can’t. As part of our yearlong #Project750 campaign, we have launched #IfHashtagsCouldFeed, a six month online initiative to inspire people to actively contribute towards ending classroom hunger in India. Conceptualised to raise awareness of the fact that while hashtags can do numerous things like highlight issues, start discussions and communicate emotions, unless they are accompanied by action they do not have the power to produce tangible results. In a nutshell, hashtags can help raise awareness, but alone they cannot change the world. People can. If you want to know more about #IfHashtagsCouldFeed, the video below says it all. Over the past two weeks, in our posts ‘Partner with us on World Hunger Day‘ and ‘Understanding India’s Hunger Problem‘, we have discussed the severity of hunger and malnutrition in India. Today on World Hunger Day, we’re here to ask you to ‘Do something great’ to help end this situation. If you’re not sure how to get started, here are some ways you can partner with Akshaya Patra to help end classroom hunger in India. Donate: Today we feed over 1.4 million children across India every day. But we’re on a mission to reach out to 5 million children by 2020. You can help get us there by making a contribution towards the programme. A small donation of just Rs. 750 is enough to feed one child the daily mid-day meal every day for an entire year! Help change a life. Volunteer: Help get the word of Akshaya Patra’s work out there by advocating for us! Volunteer at our programmes, promote our organisation via your social media, blog for us, take part in any way that you like. Use your skills to make a difference in the world. Fundraise: Help us by raising funds for our programme! We have many different kinds of fundraising options, or you can write in to us at infodesk@akshayapatra.org with your own ideas. We also help you out in any way we can, and provide you with the basic branding collateral you’ll need. You can run your campaign individually, or with your friends. It’s easy and super fun! CSR: Ask your company to partner with Akshaya Patra as part of their CSR (Corporate Social Responsibility) programme. Some of the ways by which we provide CSR opportunities are through philanthropy in funds and in-kind donations, cause-marketing initiatives and events and sponsorships. Be a Fellow: Take part in the next round of our year-long, paid Social Innovations Fellows Programme where we give you the opportunity to make a social impact and develop your leadership skills. Get first-hand insight into the social sector and learn how to build and sustain social initiatives! 66 million primary school children go to class hungry every day in the developing world. Still think the world doesn’t need your help? What can Rs. 750 get us? A nice meal out, some nice clothes to wear, two movie tickets – things that will bring us a few hours of enjoyment. But what if Rs. 750 could achieve more than we realise, such as a daily meal every day for an entire year! It sounds almost impossible, but it’s not. That’s what Akshaya Patra has been providing to underserved children all over the country. For every contribution of this small amount that the Foundation receives, one child will be able to eat the daily nutritious mid-day meal, and stay in school for a whole year more. Akshaya Patra has been raising awareness of this through their Project 750 initiative which highlights the numerous things that we easily spend money on every day, and offers the alternative of using that money to provide food and education to a child for a year. Through this year long social media initiative which has been running from March 2015, gradually people have begun to realise that they have the power to change a child’s life and one day eliminate classroom hunger in India. To help us achieve this, donate here.